This is an install I did for a customer in Reading. This Mercedes AMG C63 Estate was a brand new vehicle. I also believe I am the first installer in the country to attempt this installation. 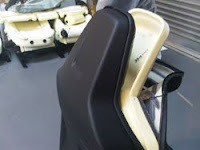 You will see from the photos included, that the AMG seat is no longer the same as a regular C-Class. They are now a 'Bucket' type racing seat. This technically means no headrest and a fixed backrest position. This is the solution I came up with. The seats were removed from the car. At this point I would like to say it was a mistake. Once out of the car, I found that the seats actually sat at an angle, so I put the seats back in the car and took my measurements from there. Now when you look at the pictures of the install, you may think, that doesn't look straight. This is because both seats are slightly raised on the inside, next to the centre console. Meaning, angling the screen right would be difficult but not impossible. I made the bezel from P45 fibreglass filler. P45 is a bit easier to work with for this kind of job as opposed to normal fibreglass. It's also a lot stronger and lighter than P38 filler. I did use P38 for finishing and smoothing. 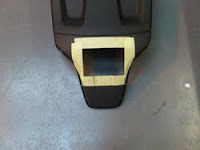 I measured 3/4 inch from the hole cut to give me the shape and angle of the bezel, this helps keep things symmetrical and to keep things the same for both seats. To make the bezel, firstly the screen comes with a mounting bezel. 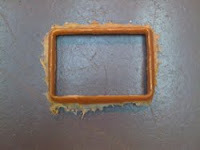 I used this as template for the inside of my fabricated bezel. To keep it clean, I masked it up with newspaper and masking tape. Now this is the trick for later when it comes to trimming. around the outside of the screen bezel, I masked a piece of cardboard, about 3mm thick around the sides of the Clarion bezel. When the cardboard is removed, it gives an extra 3mm of space around the fabricated bezel to fold the leather into, thus creating a really snug fit for the screen bezel. 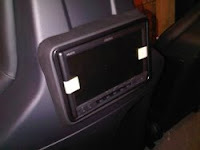 Within an hour I could remove the screen bezel to make the second mount for the passengers seat. Although the fabricated bezel was hard, it still wasn't set properly as it was still a little warm. The warmth is from the chemical reaction between the P45 filler and the hardener and nothing to worry about. With both of the fabricated bezels now made I continued with the smoothing process, sanding then filling with P38 easy sand filler and sanding again and then filling and sanding again. This is the most important bit as leather will show any imperfections underneath without the aid of foam. I didn't have the luxury to use foam backing so I had to make sure they were really smooth. Once they were smooth, I then proceeded to trim the bezels. I used an anthracite nappa leather to match the seat leather. Now to get this to stick and hold properly is to use Dunlop Contact adhesive. Before you use the glue, have a practice as to how the leather will wrap around as you will only have one chance at it once the glue is applied, it's that good. The correct way to apply this glue is to paint it on both the surfaces of the item you are covering and whatever you are covering it with. You then let the glue pretty much dry, it needs to be tacky to touch but not come off on your finger. Then join to together, you have about 10 mins until it goes off completely and you can also use a little heat to tack it up again. So I didn't have a stitch join, I laid the leather over the front of the bezel and stretched it around. Because I used leather it was quite easy to do. Leather is stretchy, it's cows skin and with a little heat from heat gun you can shrink it to shape. Don't apply too much heat as it can burn. I then trimmed away the excess leather from the centre and sides. 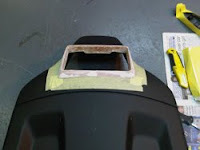 On the back edge of the bezel, it was still bare fibreglass, so in order to stop it from making any noise whilst the car was moving, I sprayed it with standard spray glue and trimmed with black carpet. 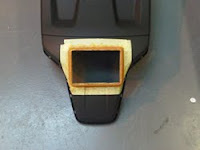 I trimmed away all the excess carpet from the edges of the bezel with an extremely sharp pair of scissors. With the bezels completed I ran the wiring through the seat and fixed the back cover on to the framework. 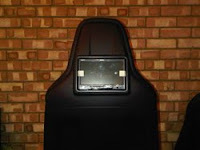 I fixed the bezel and screen bezel to the seat back. I used 2 screws at the bottom and had to cable tie the top as the only thing to connect to were the internal headrest poles. I then placed the seat foam and cover back on the seat. That might sound easy from that statement but believe me, it takes a bit of effort to get it back on looking like factory again!